We’d love your help. Let us know what’s wrong with this preview of The Dollmaker of Krakow by R.M. Romero. Karolina is a living doll whose king and queen have been overthrown. But when a strange wind spirits her away from the Land of the Dolls, she finds herself in Krakow, Poland, in the company of the Dollmaker, a man with an unusual power and a marked p In the land of dolls, there is magic. To ask other readers questions about The Dollmaker of Krakow, please sign up. Karolina is a doll that lived in the land of dolls, before waking up in krakow in the shop of a dollmaker. It’s 1940 and the nazis march into Poland and from there on Jews are being treated differently. It’s a great story for everyone above 8-10 years, that shows them what it was like under the nazi regime. With the little magic in it, it makes the story so much more appealing. All of the characters are wonderful and I fell in love with them from the start. They are really well written and have great different personalities. In this world magic exist, not much and not great world-destroying-magic. But even with little magic, things can change. Friendships are a big part of this story and the fact that sometimes friendships feel like family and you want to protect your family. What a heartfelt historical fantasy novel. Perfect for young readers reluctant of historical fiction, this beautiful and devastating story incorporates delightful magical elements. Karolina is a doll who lives in the Land of the Dolls, until she wakes up in a doll maker’s shop. She is there because the doll maker needs her help to break out of his shell and connect to living people, not just dolls. Meanwhile, World War II begins and shatters lives… getting closer and closer and darker 3 1/2 stars. Meanwhile, World War II begins and shatters lives… getting closer and closer and darker and darker. No one can escape it, especially not Jews. And although the doll maker is not Jewish, he and Karolina have befriended a Jewish family they both dread losing. Like (hopefully) everybody else, I have studied both incredibly horrendous wars at school, and still am for that matter, but I didn’t until I started high school, therefore I find fantastic that we have such historical novels for middle grade readers. The characters are empathetic and realistic, even the doll. Many times over, I was crossing my fingers, hoping the war wouldn’t ruin all that is beautiful in Krakow, but alas, it wouldn’t be World War II if it didn’t. The characters absolutely did not deserve what came for them, but then again, good people rarely do. I recommend this to young readers. If I could, I would hop on a bicycle and visit every family to distribute a copy of this book. *The only thing you have to remember is that it’s slow-paced and not complex enough to expose you to new information about WWII, so it’s highly possible you read about what you already know, i.e. stars worn, concentration camps, cruelty towards Jews, disappearances, invasions, etc. I will admit there were parts I was hoping for more new, stimulating content. The Holocaust is a difficult subject to write about, let alone when your target audience are children, but R. M. Romero managed to pull it off in this novel. The fantasy elements can be an enticing entry point into an important and emotionally challenging topic. However, don't let the fact that it's a children's book keep you from reading it. "The Dollmaker of Krakow" is a beautifully written, profound, and poignant story that will leave its imprint on a reader of any age. First of all, let me a The Holocaust is a difficult subject to write about, let alone when your target audience are children, but R. M. Romero managed to pull it off in this novel. The fantasy elements can be an enticing entry point into an important and emotionally challenging topic. However, don't let the fact that it's a children's book keep you from reading it. "The Dollmaker of Krakow" is a beautifully written, profound, and poignant story that will leave its imprint on a reader of any age. First of all, let me acknowledge that the lovely cover coaxed me into reading this book. The cover art is enchanting, and the choice of colors is a direct contrast to the dark and sad tale. The art extends within the pages as well, with beautiful character portraits, and engaging illustrations that supplement the narrative. The historical detail within the book is interesting and accurate, and Romero cleverly weaves this together with fantasy to appeal to all type of readers. Rich with fairy-tale tropes, the book really tells two parallel stories: the fate of the Land of the Dolls, and the fate of Poland and its Jewish citizenry. Narration hops back and forth between the worlds, maintaining a straight up comparison that surely works for the intended age-group. The parallels are quite simple: A wicked witch creates a horde of fearsome, insatiable rats who overrun the Land of the Dolls -- terrorizing, abusing, and killing the doll population. Meanwhile, Hitler deploys the Nazis over Europe -- terrorizing, abusing and killing Jews. The writing is simple but poetic, and encourages younger children to establish empathy with the victims. Through Karolina's perspective, you get to see the heartbreaking cruelty of the Nazi regime --and the crimes are told in a way that all ages could understand them. Polish folklore is incorporated into the story, adding insight on Polish culture, and on the historical context of the novel. One example is the Lakanica, the spirit of the meadow that would become the Auschwitz-Birkenau killing ground. My favorite character in the book is undoubtedly Karolina. She is full of love, compassionate, and she will stop at nothing to help her friends. How fitting that in this tale -- a doll, normally taken as a mere copy of humanity, feels and exhibits more humaneness than actual humans who purport to decide who is a worthy human and who isn’t. As for the human characters, they are well-crafted, and feel very -- well, human. In the story, Jozef and his daughter, Rena, are among the groups persecuted in Krakow. Through them, Romero emphasises the effects of the Holocaust on individuals who lived, breathed, and contributed to society before their persecution. This was very important as victims are often forgotten as people, and remembered as statistics instead. The dollmaker, Cyryl, despite his fears and advantages, chooses a difficult path -- showing that even one person can make a difference in the world by being brave enough to protect those he cares for. “Podemos escolher participar em atos odiosos, fechar os nossos olhos... ou aliviar a dor que vemos no mundo através da coragem e da bondade. Books are an affair of the heart, and this one hit the arrow straight into its target. In two different worlds a war has broken out. One world is the Land of the Dolls, and the other being our world during WWII. Karolina is a doll, a seamstress in her kingdom, where dolls like her go after they have been abandoned by their human owners or are not wanted anymore. Karolina has no interest in ever going back into the human world, but finds herself destined to return and wakes up in a dollmakers’ shop in Krakow, the Republic of Poland. The dollmaker is a very skilled craftsman. The best in town. He is working on a beautiful dollhouse when Karolina comes to life and speaks to him. Naturally, the dollmaker likes to stay to himself, but he is learning, that he possesses this magic to bring dolls to life. The two of them develop a bond of deep friendship during their time together, as in both worlds the situation grows more and more dyer. Together they witness their Jewish friends being taken away. They experience confrontations of German officers as they are trying to help. At some point, the dollmaker reluctantly accepts to be a “Volksdeutscher” on paper, so he can get extra rations to help out the remaining children in the ghetto. And together, despite many dangers, Karolina and her human friend will go beyond boundaries to do their part of resistance in this war in the human world. But will they make it through the war together, and what will happen to the Land of the Dolls? Where would I be in my life without the evoking books like these? The elixir of emotions…. Speaking to my inner child as well as my reasonable adult being, the interweaving whimsical, magical way to portrait such horrible events in history with an imaginative world, was a great way to write this novel and introduce young readers to the reality of WWII. In a very gentle approach, this novel inches closer and closer to the happenings in concentration camps and Hitler’s “Final Solution” plan. Most adults, familiar with the history, will not learn anything new in this novel. There is no happy end to the tragedies that have happened, and although age appropriately written, the reality is not hushed over or made into a fairytale ending in this novel. I thought that was a very interesting and strong point. I enjoyed all the little drawings mixed in and the descriptions of polish art and places. Just look at that cover, isn’t it beautiful. Simply a poignant, exquisite read. This book is a strong contender for my favourite book of 2018, it’s going to take a lot to beat my enjoyment of this book! If you do buy yourself a copy of this book (which you should), you should absolutely buy the hardback edition. Not only is the cover beautiful, the pages smell divine (if you’re into that kind of thing) and there are illustrated embellishments to the pages that you just don’t see these days that makes the book feel extra special. The story itself comprises of two parts in alternating chapters; a war in the Land of Dolls where rats have come from across the sea to eat all the gingerbread houses and sugar flowers, and the development of WW2 in Krakow, Poland. When Karolina, a doll, is brought to life by a WW1 veteran dollmaker in Krakow, they form an unbreakable bond and she sees familiar atrocities take place as the Germans invade the city. HOWEVER. This book reads like a fairy tale, a magical talking doll and her human friend see the magic in the world, the pain of loneliness and the importance of being kind. The writing is so beautiful, you read the human aspect of the war through the eyes of a doll with all the compassion you’d expect from a doll designed to comfort children. The Dollmaker himself gains so much from having her around, pushing him to make connections with the people around him. Karolina is brave, intelligent and strong willed when it comes to protecting those around her. When I went into this story, I knew it would be sad, given the contents, but I never thought that it would be so beautiful, or so haunting. I never could have expected it to nestle itself so deeply in my heart. This story devastated me in the best way, and I will cherish it forever. All Karolina wants is to save the land of dolls from the evil rat invaders, but when she comes to life in our world, she’s surprised to learn th When I went into this story, I knew it would be sad, given the contents, but I never thought that it would be so beautiful, or so haunting. I never could have expected it to nestle itself so deeply in my heart. This story devastated me in the best way, and I will cherish it forever. All Karolina wants is to save the land of dolls from the evil rat invaders, but when she comes to life in our world, she’s surprised to learn that there is a terrible war brewing in Poland, too. Despite her concerns about her home, which we learn in snippets through flashbacks and memories, Karolina’s efforts quickly become wholeheartedly committed to doing whatever is in her small powers to help the Jewish individuals in Poland. I adored her character so much – she is sassy, clever, and above all, kind. She loves the Dollmaker with her whole heart, and will go to any lengths to comfort him, and their Jewish friends, during the terrible times ahead. The part of this story that most took me by surprise was how heartfelt and genuine the love between Karolina and the Dollmaker is. Karolina is precisely the friend that the Dollmaker needed, and she never grows weary of his depression, anxiety, or self-deprecating thoughts. No matter how dark his thoughts become, Karolina is always there to support and encourage him. She is tremendously concerned for his well-being, especially concerning his lost leg and the ways his disability ails him both physically and mentally, and I felt like her behavior was a beautiful example of how we can love someone without requiring them to be happy or whole all of the time. Of course, Karolina and the Dollmaker don’t only love each other; they also love their Jewish friends, Jozef and Rena, who they go to great lengths in attempts to protect and comfort. Watching Karolina as an outsider, slowly coming to realize that the Jewish people were not simply moving away, but being taken to face terrifying fates, was such a brutal and unique perspective on a holocaust story. Krakow had become a prison for all Jews, and Karolina’s heart went out to them. Please, don’t let it happen again. Holocaust and Magic -- what a strange combination! The author's purpose was writing a book with a message "Never Again" enough apealing to kids. Kids are about to be leaders and rulers. Like it or not, sooner than later they’ll be the architects of human society. So... “Never Again” — makes sense, doesn't it?! 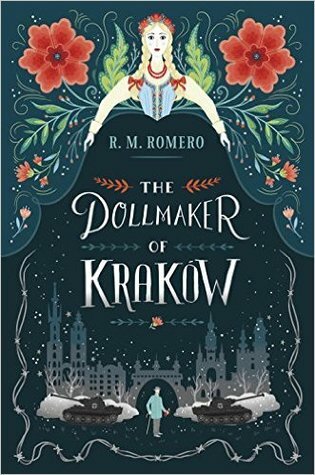 I thoroughly enjoye The Dollmaker of Krakow is a beautiful story that parallels a country called The Land of Dolls with 1940’s Kraków, Poland. Karolina was living in the world where dolls come to rest after their doll bodies perish here on Earth. In that world, she was a seamstress who would sew wishes into each article of clothing that she made for her doll customers. At the start of the story she is not in that world for very long before she awakens to find herself in the home of the Dollmaker. I enjoyed the first few chapters, but the more I continued to read the less interest I had in the story and the characters. I picked up this book because I thought it would be interesting and something I would enjoy reading. But I couldn't get into it. I did not like the writing style. A fairytale in a bleak world, The Dollmaker of Krakow is a whimsical story set with a tragic background. Following Karolina, a living doll lost in the world of war-torn Poland, this middle-grade/children’s novel seems to me the perfect way to set a book during the war without it being *too* hard-hitting. Don’t get me wrong, the dark, bleak world is very much there, but the magical – almost adventurous – side to the story helps to alleviate the horrific side of war while still discussing the events that took place. Perfect for a slightly younger audience. But though this is a children’s novel, it’s a story that could be enjoyed at any age. I’m sure most people still have heart for that comforting feeling a magical story brings, and this one was no different. Charming seems to be the perfect word to describe it. Which brings to mind fairy tales of princes slaying dragons but…not quite. How about magic dolls teaming up with a toymaker to save their friends during the war, instead? It still holds that fanciful, adventurous, almost nostalgic feel. The writing alone has the traditional “storytelling” feel associated with childhood tales. Not only is the story stunning, but the book itself is too. The cover is one to fawn over, but the inside pages really give it that extra li’l something. Each chapter has a dedicated illustration, and the chapters dedicated to Karolina’s backstory are outlined with thick, intricate borders with tiny details relating to the story. It was so lovely turning the pages and seeing the designs, knowing full well they were helping to bring the descriptions alive in their own little way. Cudownie baśniowa, przeszywająca serce milionami utraconych głosów opowieść o piętnie wojny. Historia niewyobrażalnego cierpienia, wszechpotężnego zła, ale także prawdziwego dobra, które w chwilach największej ciemności było ostatnim ze świateł. "Lalkarz z Krakowa" poruszy młodszych i starszych czytelników, przypominając, że zawsze jest wybór, zawsze jest nadzieja. To lektura, w której dylematy bohaterów zrozumie każdy z nas, bo jedyny wybór jaki mamy, to albo być człowiekiem dla drugiego człowi Cudownie baśniowa, przeszywająca serce milionami utraconych głosów opowieść o piętnie wojny. Historia niewyobrażalnego cierpienia, wszechpotężnego zła, ale także prawdziwego dobra, które w chwilach największej ciemności było ostatnim ze świateł. "Lalkarz z Krakowa" poruszy młodszych i starszych czytelników, przypominając, że zawsze jest wybór, zawsze jest nadzieja. To lektura, w której dylematy bohaterów zrozumie każdy z nas, bo jedyny wybór jaki mamy, to albo być człowiekiem dla drugiego człowieka albo wilkiem. Albo aniołem albo demonem. Tego nie trzeba tłumaczyć, ta historia jest uniwersalna i przemówi swoją magią do każdego czytelnika, także tego, który nie potrafi jeszcze zrozumieć, albo który już nie potrafi pojąć ogromu grozy jaki niesie za sobą wojna. Ha sido un libro con una historia muy bonita y dura. Una mezcla entre cuento y realidad. Мила и тъжна приказка, подходяща за деца между 10 и 13-14 години. Специално искам да спомена чудесната корица, която предлага сетивно удоволствие дори на тактилно ниво. Juguetes, niños, muñecas, magia y el horror nazi. ¿Qué podía fallar? Una bellísima historia durante la ocupación nazi de Polonia. La creatividad, el amor y su magia luchando contra la barbarie y el sinsentido del odio racial. Una obra de arte a la altura de 'El niño del pijama de rayas', un cuento dentro de la brutal realidad. Cuando vi este libro y leí su sinopsis algo me dijo que iba a ser bueno; no me equivoqué ni un ápice. Sin duda no hay que perder a su autora de vista porque nos traerá gra Juguetes, niños, muñecas, magia y el horror nazi. ¿Qué podía fallar? Una bellísima historia durante la ocupación nazi de Polonia. La creatividad, el amor y su magia luchando contra la barbarie y el sinsentido del odio racial. Una obra de arte a la altura de 'El niño del pijama de rayas', un cuento dentro de la brutal realidad. "You can destroy a person...but destroying their story is far more difficult. No one is ever really lost as long as their story still exists." "This world was marching into the dark, and Karolina was being pulled along with it. And in the dark, she knew that she would know loss in whatever terrible form it took." The Dollmaker of Krakow by R.M. Romero is a story set during World War II in Krakow, Poland. When a lonely Dollmaker breathes life into a doll named Karolina, their lives are forever changed. The two form a fast friendship with a Jewish father and daughter, Jozef and Rena, and the happiness they share begins to eclipse the Dollmaker's loneliness. This shatters, however, when Nazi Germany invades Poland. New laws have been put into place that limit the freedom of Krakow's Jewish population, and the Dollmaker and Karolina will do whatever it takes to make sure Jozef and Rena are safe. It's difficult for me to talk about this book, partly because the wounds it inflicted upon me are still raw. But oh, was it so good. I've found that middle-grade stories haven't really done it for me as of late, but The Dollmaker of Krakow surprised me. I haven't felt this enamored with a middle-grade book in a long time. I think it's because this story could be read and enjoyed by anyone of all ages. For one, Romero's writing was beautiful. She conveys deep emotion within a scene effortlessly. Granted, it was rather simplistic, but I thoroughly enjoyed the writing style, and Romero seamlessly blended magic and history into the story. The characters were also delightful. I loved everyone. Karolina was spunky and spirited, and her voice was a vibrant narrator for the story. She had a rigid sense of right and wrong that was ultimately put to question; how could good people turn their backs on the suffering of others? How could young men blame their misfortunes on a group of people that did nothing to them? In this story, Karolina is exposed to the horrors or war, and the messy nature of humanity. But the living doll also experiences love, and family. The Dollmaker, Cyril, was lovely. His growth throughout the story was incredibly rewarding, and the friendships he established, with Karolina, Jozef, and Rena were beautiful. In World War II, there were good people who turned their backs to suffering. But there were also heroes like the Dollmaker, who sacrificed everything for the people he loved. Like Cyril, you come to love Jozef and Rena too, and I felt bonded to this little found family. Magic is blended into this historical fiction story, and it added a sense of whimsy to the narrative that never lessened the emotional impact of the story. Cyril, for one, has the ability to bring the toys in his shop to life. Sure, some things are left unexplained, but it never bothered me. My favorite magical element of the story was Janosik, the mystical thief with fiery red hair whose feet never touched the ground. I honestly wish we'd gotten more from him. By the end of this story, I was emotionally drained. I truly do believe this is one of the best middle grade stories I've ever read. The elements of friendship, magic, and whimsy all coalesced beautifully in the war-torn setting of Krakow, Poland. If I were to describe this book by combining alike stories, I'd say this book is the lovechild of The Book Thief and Toy Story. Anytime you pick up a book that is set during WWII you must be prepared for a sad or at the very least a bittersweet ending; even when it's a middle-grade book. The Dollmaker of Krakow is set in German occupied Poland. As a survivor of WWI whose missing a leg, the Dollmaker is a quiet, downtrodden older man. To me he felt like the kind of old man that you just want to hug and listen to all day long. I adore him. As this is a middle grade (ages 9-11) book it conveys th Anytime you pick up a book that is set during WWII you must be prepared for a sad or at the very least a bittersweet ending; even when it's a middle-grade book. As this is a middle grade (ages 9-11) book it conveys the horror of the treatment of the Jews and the Polish people in a way that children can understand. And even though I knew how it was likely to end and that not everyone could get out, I still couldn't wait to read more each time I had to put it down. Our other main character is a doll that has come to life. This doll named Karolina, lived in the Land of the Dolls first and experienced a war herself. She is unlike Pinocchio in every way and instead is our Jiminy Cricket of the story, always telling us what is right and wrong. The focus of the book is the telling of two parallel stories. One of the Land of the Dolls being invaded by rats (told in past tense) and the other of Poland being invaded by Germans (told as its transpiring). As the story is told from Karolina's perspective we have a constant voice asking why people are doing these things and questioning why the Germans are so awful; but also questioning why the adults don't fight back. This allows the story to be told in a way that keeps the message clear; the actions of the soldiers are wrong and immoral and that the Polish are afraid and most are not at fault. I like this treatment of the story and morality a lot. It allows R.M. Romero to keep the story true to actual events (ie: Jews being moved around and eventually onto the trains if the Germans aren't just outright killing them in the streets) without the need to lie about what happened. I believe it's important we tell children the truth of events and situations so that they can know not to repeat these actions. If we ignore history and it's awful moments then I fear humans will make the same mistakes again. We must teach our children to have their eyes open and be able to identify fascism, racism, injustice, etc. early and then to try and give them the tools to fight back long before an army is invading. There is some fictional magic in this book. It's used sparingly and really only to allow for two major events. First for Karolina to exist at all in our world (talking doll and all) and second for a major plot point to be plausible. I think it's brilliantly used and absolutely love that it's very specific and used sparingly. It helps keep the majority of the events in the story realistic. I have only one major complaint about this book. Which frankly is amazing as even some of my favourite books still have multiple issues. Word choice is something that really good authors pay a lot of attention to and actually think about. All of the vocabulary in The Dollmaker of Krakow is well chosen (for reading comprehension of the 9-11 age bracket and for tone and impact to the story). All except for one word. This is what Karolina calls the Germans. Some are worst witches than others in the dolls mind and she does discuss that briefly. There is also a distinction made between magicians and witches (I will concede that witch is lowercase on all uses at least). A magician can be good or bad. I'm not sure why Romero decided to use the word witch, but I really hate it. Using it to describe the Germans soldiers perpetuates the use of witch as a word for someone evil or wrong. In actual fact there are people who identify as Witches in modern day (yes my caps usage is intentional). Witches are commonly followers of Wicca but can be Pagans in general depending on who you ask. Witches are generally people who believe in nature as the strongest force in the world and follow the sentiment of 'If ye harm none, do what you will'. An obvious hurt no one belief and certainly contrary to the definition used. I believe this is likely an innocent mistake by Romero to choose the word but it's still a mistake. If Romero wants a word for monster or evil that children would understand easily I believe there are much better choices. Despite my cringe each time Karolina called a soldier a witch, I still absolutely loved this book. The Dollmaker of Krakow is a gem. Written in the magical voice of a little doll who comforts and helps a lonely old man; it's impossible not to be in love from the opening word to the final period. If you are a crier I would recommend some tissues for sure. I'm not a crier but still nearly succumbed at one point. For me that is a showing of how amazing and powerful this story is. This is a book that transcends age or genre. It tells the truth, and reminds the reader at every turn of what is right and wrong. In the scenarios in The Dollmaker of Krakow there are very few grey moments of morality. Instead it is black and white which I believe will help children understand the travesties better. Destroying people is never okay; whether the destruction is running people from their homes, starving them or (obviously) ending their lives. A spot next to The Book Thief and The Sky is Falling. is now being reserved on my shelf for The Dollmaker of Krakow. I can't imagine not adding it to my permanent library in a place of honour. It definitely deserves to be there next to other fantastic WWII children's novels. I usually don't enjoy books with Polish touch written by not-Polish authors, because most often they are based on stereotypes and harmful presuppositions about Poles and Poland itself (see Bone Gap). But I like reading such books just to complain about them (yup, I’m one of those). I learned about “The Dollmaker of Kraków” from one of Regan’s (PeruseProject) videos and it caught my attention, because 1. the author is definitely not from Poland, and 2. it is set in Kraków, where I live atm and it I usually don't enjoy books with Polish touch written by not-Polish authors, because most often they are based on stereotypes and harmful presuppositions about Poles and Poland itself (see Bone Gap). But I like reading such books just to complain about them (yup, I’m one of those). I learned about “The Dollmaker of Kraków” from one of Regan’s (PeruseProject) videos and it caught my attention, because 1. the author is definitely not from Poland, and 2. it is set in Kraków, where I live atm and it is concerned with the Jews’ situation during the WWII. So yeah, it sounded like a beautiful disaster right away, I had to read it as soon as possible! Since then, I was looking for the book everywhere and I finally managed to get it when I was in Warsaw last weekend. It’s fairly short and the font is quite big, so I went through it in just a couple of days. And, surprise surprise, I actually really enjoyed it! Yeah, some of the Polish names were misspelled, but so what? The story itself really nicely incorporates magical elements with the atrocities of war and life in an occupied city. “The Dollmaker of Kraków” is targeted at slightly younger audience, so the language wasn’t explicit at all, and yet the author managed to capture perfectly the situation of Poles and Jews with the use of metaphor and fantasy. In a nutshell, I really liked it, and you should read it. I don’t know if a similar story exist in Polish literature, but I would love to see a Polish translation of “The Dollmaker of Kraków”. Job well done, Miss Romero! Este libro es un poquito raro, no he conseguido conectar con la historia porque es una historia de fantasía ambientada en la segunda guerra mundial, algo que para mí no funciona. Porque no es que sea una historia de fantasía donde los protagonistas desconectan de la realidad como pasaba en El laberinto del fauno o en La vida es bella, es algo que, dentro de la historia, pasa de verdad, porque es suficiente con creer en la magia. Y oye... creer en la magia en medio de deportaciones de judíos y aniq Este libro es un poquito raro, no he conseguido conectar con la historia porque es una historia de fantasía ambientada en la segunda guerra mundial, algo que para mí no funciona. Y oye... creer en la magia en medio de deportaciones de judíos y aniquilaciones en Auschwitz, a mí se me hace un poquito raro. Así que he estado durante toda la lectura esperando ese momento de la revelación y ese momento en el que se ve la realidad de lo que está pasando fuera de la fantasía y la magia, momento que no se produce, porque la magia es real. En resumen, El fabricante de muñecas es una maravillosa historia de pérdida, pero también una historia de esperanza y amor, que se encuentra en los momentos más oscuros. Is it awful that I, a Jewish person, didn’t connect with this story? I liked it okay I guess? Don’t get me wrong, it was beautifully written and the each character had their own personality, but I just didn’t connect. I still liked the message it spread: it doesn’t matter if in the end you end up helping one person, it’s still one person more than no one. "The more people tell the story, the more alive it becomes." The Dollmaker of Kraków by R.M. Romero is a poignant and meaningful tale about the horrors of WWII. I was really looking forward to reading this book and I absolutely loved it! It's an exquisite story, which I hope will be able to reach to many readers. Karolina is a living doll, staying in the Land of the Dolls - a place where all toys are moved when their owners forget about them. Her country is under attack of evil rats and one day "The more people tell the story, the more alive it becomes." Karolina is a living doll, staying in the Land of the Dolls - a place where all toys are moved when their owners forget about them. Her country is under attack of evil rats and one day Karolina finds herself transported into Kraków, Poland, and the shop owned by the Dollmaker. She quickly befriends a shy man and starts to enjoy her new home but suddenly their happiness is interrupted by German soldiers invading Poland and Kraków, as World War II begins. To start off, The Dollmaker of Kraków is a middle-grade book that joins historical fiction with fantasy, magical elements. I found the author's decision to mix these two genres to be very much spot-on, as I think that way it may speak to the wider audience. Starting the story, children are first introduced to the theme of war through Karolina's experience in the Land of the Dolls and later on, they learn about true life events in Poland during World War II. The whole book makes a wonderful opportunity for the parents and teachers to talk about those historical events with children and explain everything in an easier, more approachable way. The writing and the characters were truly amazing and beautiful. Even though R.M. Romero touches upon a lot of serious issues, she does it in a very gentle way, so it fits the target audience. All the characters are well fleshed-out, real and easy to get attached too. I also absolutely adored the friendship between the Dollmaker and Karolina, how Karolina helped him open up and through that, meet people he later on saw as his family. Another thing I was excited to see, were the descriptions of Kraków, and I can say that the author did a fantastic job in creating a realistic setting, by keeping a lot of small details, characteristic for this place and country. As a Pole, I loved all the Polish words used and was also glad to see the included translations, so that other people won't have any problems with understanding them. Personally, I think that this book will appear to older readers as well, in spite of being written for middle-grade children. The writing style is a little simplified but the story contains timeless truths and values. I also believe that adults who know more about what happened to Jews and other people during WWII may find it even more heartbreaking, like I did. To sum up, The Dollmaker of Kraków is a wonderful tale of loss but also a tale of hope and love, found in the darkest times. I would truly recommend it, if you'd like to introduce your children to World War II period in history or if you're looking for a beautiful, heartfelt story. Definitely keep en eye out for it next week! I have kindly received a copy of this book from Delacorte Books for Young Readers and Random House Children’s Books via Netgalley in exchange for an honest review. This book was so beautiful! Definitely one of my favorites this year! I’m always interested in reading about the holocaust, but wow this one was special. Karolina is a doll who lives in The Land of the Dolls, but one day her home is invaded by rats and she is forced to move on. A strange wind sends her to Krakow, Poland where she meets the Dollmaker who soon finds out he has a magical gift; he can bring toys to life. Again, this was such a beautiful way to tell such a tragic event in history. Together Karolina and the Dollmaker bring hope; especially to the children of the holocaust. This story was so much more than historical fiction it was about standing up for what is right and showing kindness always. R. M. Romero the author of fairy tales and children's fiction. She lives with her witchy black cat in Miami Beach.